MiMedx Group, Inc. (OTCBB: MDXG), an integrated developer, manufacturer and marketer of patent protected regenerative biomaterials and bioimplants processed from human amniotic membrane, announced today that its common stock has been approved for listing on The NASDAQ Capital Market under the ticker symbol "MDXG." Trading on NASDAQ is expected to commence on Thursday, April 25, 2013. Until such date, the Company's common stock will continue to be traded on OTC.BB under its current ticker symbol "MDXG". 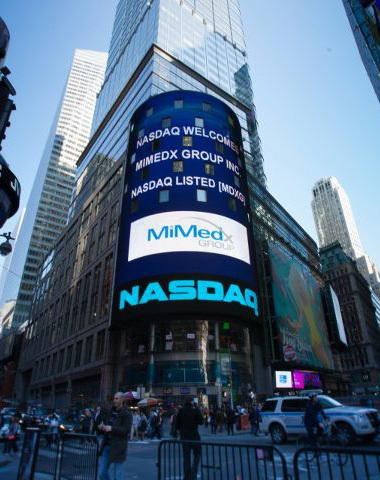 "Listing on the NASDAQ exchange is an integral part of our plan to broaden and strengthen our shareholder base," said Parker H. "Pete" Petit, MiMedx Chairman and CEO. "We expect the NASDAQ listing will increase the visibility of our stock, provide greater access to our stock and attract a broader range of investors to our stock, each of which is an essential element of our overall strategy to build shareholder value."